NES Wait and See! (Russia) in 08:50.21 by TehBerral. Wait and See! is a pirate game based off of Nu, pogodi! (Ну, погоди! ), a Russian cartoon about a wolf chasing a rabbit. 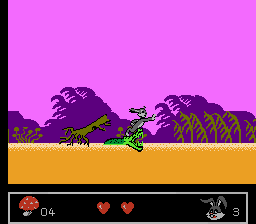 In this game, the rabbit looks a lot like Bugs Bunny, and he collects carrots (which magically turn into mushrooms) as he runs to the end of each stage. Bad controls and jumping physics make this a hard game to beat in real-time. TehBerral improves the previous run by 7.20 seconds with better optimization and new time-saving tricks. For more information, see the author's comments.